Eggs — one of nature’s simplest and cheapest sources of protein, a daily staple in our meals and ubiquitous in cuisines all around the world. It is a basic ingredient with so much flexibility but is easily overlooked. Hence, I’m starting this Food Staples series, to celebrate and honour fundamental foods which have earned a prominent place in our kitchens yet are often taken for granted. To kick things off, here’s the Egg Series, featuring the most common of eggs from chickens! Of course, there are several other types of eggs available in the market, such as quail, duck, and even ostrich! But Chicken eggs are the most universal. Better yet, they can be cooked in so many different methods, be it boiling, frying, poaching, baking, steaming and the list goes on. Here are some iconic egg dishes shot and styled by yours truly. The list is non-exhaustive and there are many more but I’m pretty sure it’ll egg-cite your taste buds! This dish frankly needs no introduction. It’s a humble favourite that’s a staple at the breakfast table. There’s a lot of debate on the best method for preparing scrambled eggs and after trying various methods, the one I like best is Gordon Ramsay’s method. Luxuriously silky eggs, with the right amount of creaminess from milk and butter, these are the eggs that motivate me to get out of bed in the morning! The Fu Yong omelette is a classic of 煮炒 ‘Tze Char’ Chinese hawker stalls/restaurants here in Singapore. It is originally a Cantonese dish dating back to ancient China in the 18th Century. Since then, it’s undergone hundreds of variations but the most common recipes feature ingredients like Char Siu (barbecued honey pork), shrimp, carrots, onions and chives. These ingredients are diced up, whisked in beaten yolks and fried till fragrant. It’s pretty much an ‘anything-goes’ kind of recipe you can never go wrong with. Pair this with rice or simply on its own and it’s the true definition of bliss in simplicity. The first time I tried Shakshouka, I was absolutely blown away. This Mediterranean dish loosely translates to ‘All mixed up’ in Arabic and they weren’t kidding with the name for it’s bursting with flavours from the myriad of spices, cumin, paprika, nutmeg and cayenne pepper for the hint of heat. It’s a brunch favourite of mine that goes great with sourdough bread dipped in the runny egg yolk! The Brits are well known for their tea scones or fish and chips, but often overlooked are Scotch Eggs. This dish features hard boiled or poached eggs (I prefer the latter of course) enveloped in sausage meat, coated in bread crumbs and dropped in a fryer. It looks seemingly simple but the execution of a perfect scotch egg with a slightly runny yolk and a silky white can be somewhat tricky. Hence, it’s one of those dishes that test the true skills of a chef. Eggs en Cocotte, otherwise known as ‘Shirred Eggs’ is a simple elegant egg dish that can be savoured almost anytime of the day. This French invention is another one of those ‘anything-goes’ recipes. Its simplest form is a cracked egg (or two) in a ramekin with a spoonful of butter, a pinch of salt and pepper baked in a bain-marie/water bath. If that’s too plain for you, feel free to unleash your creativity and add cheese, herbs, bacon or bread crumbs for a toasty crust. I like mine with gruyere cheese, mushrooms and herbs for a fuss-free breakfast or late night supper. Whoever invented devilled eggs is most probably a genius. This dish is so easy to prepare and can be prepared in so many ways with various ingredients and flavours. It makes the perfect appetiser at parties or perhaps a tasty treat for a picnic in the park. There are easily a million variations of devilled eggs ranging from simple 3-ingredient recipes to over-the-top ones with truffles and/or caviar. I like mine mixed with sriracha and crisp bacon bits that add gentle heat and a nice savoury surprise with every bite! 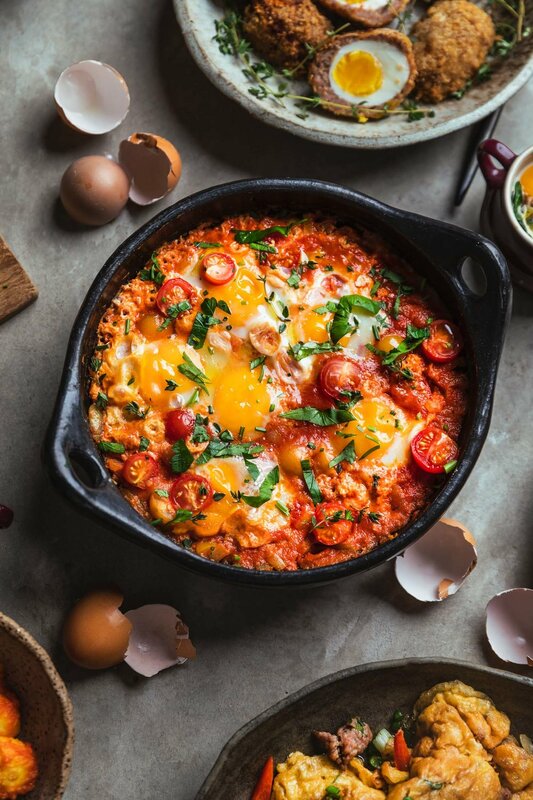 Originating from rural Mexican farms as a mid-morning breakfast, Huevos Rancheros is the ultimate eggy breakfast with all the nutrients of the food pyramid. It features fried eggs with corn tortillas, Mexican style rice, salsa, peppers and beans all served piping hot on a large plate. It’s got the optimal balance of salt, fat, acid and heat that’ll fuel you up for the day. It goes great with guacamole but alas I wasn’t able to get good avocados that day. I wouldn’t mind working as a Mexican farmer if I could enjoy this for breakfast everyday! 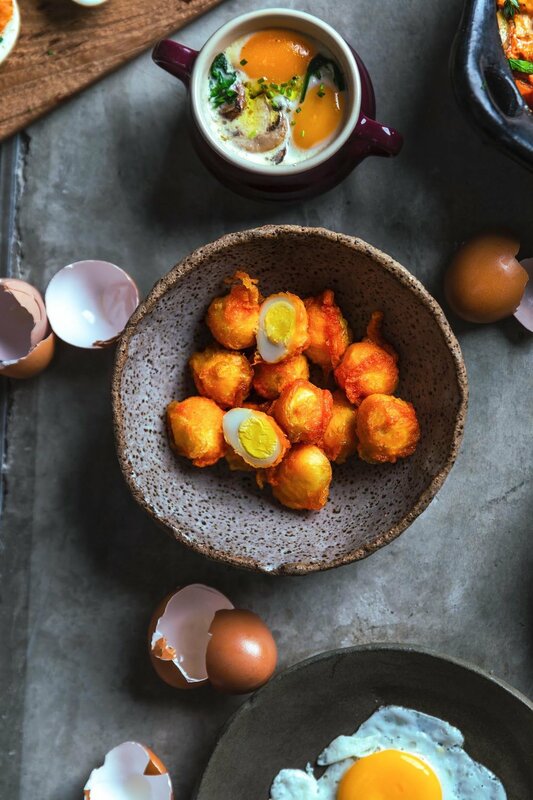 The onomatopoeic name of this egg dish may amuse you but Kwek Kwek is actually a popular street food in The Philippines! This tasty snack consists of boiled quailed eggs tossed in a flavourful batter of orange annatto powder, garlic and chicken seasoning, then deep-fried to a golden crisp. I kid you not when I say that these are super addictive! Andhra Egg Curry is a quintessential dish of many South Indian households and it’s no surprise why. Simple hard boiled eggs steeped in a flavourful curry of aromatic spices. It goes great with almost anything, from Roti (Indian flat bread) or idlis to basmati rice. A comforting dish that can be enjoyed at all times of the day! This is simply a non-exhaustive list of egg dishes that I love. There are so many more out there from recipes and cultures all around the world I’ve yet to explore, but for now , this concludes the first of my Food Staples series. Nevertheless, I’d love to hear what are some of your favourite egg dishes, so let me know in the comments below. Stay tuned for more!